REVIEWS: Lucky Dog – Pink Label – I Love It Spicy! Pairing Suggestions: Pink Label is the perfect compliment to pork, especially carnitas! Also great on pulled pork, pork chops, pork roast, pork loin, and just about any other incarnation of pork. While the white vinegar adds sharpness, the subtle notes of pear & date really open up with pork. Of course this sauce is also delicious on eggs, sandwiches, breakfast potatoes, traditional Mexican food, pizza and just about anything else – the fruit notes are extremely subtle on most dishes. Garlic, onion and peppers dominate this unique and versatile sauce. Pink Label hits hard with flavor while building up in heat. 100% fruit sweetened with no cane sugar, Pink Label is yet another reason that Lucky Dog Hot Sauce is Food’s Best Friend! Lucky Dog Hot Sauce Pink Label is a Winner! Lucky Dog Hot Sauce was my hobby for 7+ years. In 2005 I started developing recipes in my kitchen & on the back yard grill. And in June of 2012 I turned it into a small business due to overwhelming demand. I simply could not keep up with all of the people who gobbled it up so fast! Every batch I made, I’d have none left for myself – which was kind of depressing since that’s why I started making it in the first place. So now I’ve found a commercial kitchen to work with and I’m making a lot of it! My goal is simple: always innovate, never imitate. 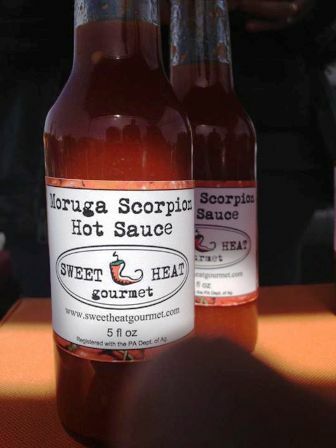 My mission is to produce the most balanced, flavorful and versatile hot sauces possible, with emphasis on local sourcing. Lucky Dog hot Sauce is designed to be used on almost everything, and to appeal to all tastes from moderate to strong heat yet without overpowering food. I have great respect for those who cook well and/or appreciate a good meal. The best compliment to Lucky Dog Hot Sauce is that people choose to use it liberally on their favorite dishes. I believe in flavor above all else, which is why Lucky Dog Hot Sauce is created with savory fire-roasted hot peppers, sweet carrots, tangy vinegar, fresh onions, assorted dried peppers, and heaps of roasted garlic. The lightly smoked varieties add subtle fruit notes to the mix, creating balance and layers rarely experienced in the hot sauce world. This nuanced approach brings a complex taste with respectable heat in attempt to raise the bar for what a hot sauce can be. Lucky Dog Hot Sauce is truly Food’s Best Friend! Lucky Dog Hot Sauces are all-natural, completely original and are made with only the highest quality ingredients in a stunningly clean and modern production kitchen by experienced production chefs in beautiful California. Lucky Dog Hot Sauce proudly supports California farmers & local businesses. Lucky Dog Hot Sauce is sublimely versatile and compliments a wide variety of cuisine, from the classic American cheeseburger to Indian, Chinese, Thai, Korean, Mexican, Italian, Jamaican, Filipino, Greek, or Middle Eastern food. Use Lucky Dog Hot Sauce liberally on anything, from chicken, fish, pork, and beef to pizza, eggs, sandwiches, potatoes, as an ingredient in your favorite recipes, on lasagna, vegetables, in soups, mixed with oil as spicy vinaigrette, in marinades, or mixed with mayonnaise as a spicy aioli or with melted butter for a wing sauce or veggie glaze – and much, much more! Tops off an epic burger perfectly too! Lucky Dog Hot Sauce is my hobby, my life, my passion and my dream. Now I’m just living the dream. I thank you for trying Lucky Dog Hot Sauce and I welcome your feedback. Hey thanks for taking the time to review my sauces again guys, and so glad I didn’t disappoint! And to Matt – good news coming for you in 2016 my friend. Wanting larger bottles has been my biggest customer complaint/feedback since I launched, so I’m moving towards that. Wish me luck!